Renuka do Brasil is developing actions for adequate management of solid wastes generated in the mills, with an eye towards approval of the National Solid Wastes Policy. The bagasse resulting from the milling of sugarcane is used for cogeneration of electric energy, which is used in the industrial process and the company's administrative sectors, and the rest is exported, contributing to the supply of electric energy when the hydroelectric dams are at low water levels. The other solid wastes, such as filter cake, are composted and continuously monitored and utilized as soil conditioners in the mill's agricultural areas. The company performs selective collection of recyclable wastes, sending them to recycling centers. Toxic wastes are sent to waste handling companies for environmentally responsible disposal. For constant improvement, a Solid Wastes Management Plan (PGRS) for Mills Madhu and Revati is in progress, as well as an Environmental Education Program for improvement of the PGRS, which will involve all the units' employees. 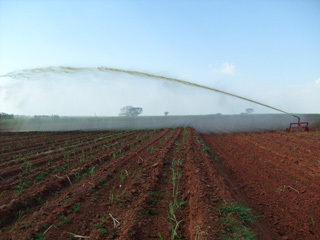 The vinasse produced by the units of Renuka do Brasil - residue of ethanol distillation - is disposed of in soil in a manner controlled by an environmental agency, in that there is a PAV (Application of Vinasse Plan) which is presented to CETESB and followed rigorously during the season to avoid environmental damage. Rich in organic material and nutrients, and considered by specialists as an excellent fertilizer for soil, vinasse provides numerous benefits to the physical, chemical, and biological properties of soil, such as: elevation of pH, increase in Cation Exchange Capacity (CTC), increase in availability of certain nutrients, improvement of soil structure (by addition of organic material), and reduction in use of chemical fertilizers. To guarantee the preservation of streams, storage of vinasse is done in reservoirs sealed with geomembrane, and is brought to the field by special tank trucks or aluminum tubing, in this case, with security system when crossing water paths.